Families looking for some last-minute sporting action abroad this Easter can take advantage of savings of 10 per cent and a free night’s accommodation when staying at Spain’s five-star La Manga Club this month. Guests can enjoy a variety of discounts when heading to Spain’s flagship resort over the school holidays, including five nights’ accommodation for the price of four and seven nights for the price of six. 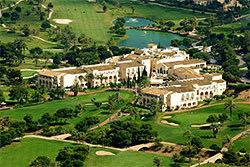 Bookable until April 28 in both La Manga Club’s luxury Hotel Principe Felipe and four-star Las Lomas Village, five-night packages for a family of four in a two-bedroom apartment start from only €855 (approx £730), while resort credit vouchers of €100 on breaks of five to seven nights and €200 for stays of eight nights or more are also on offer. And with so many savings available, all members of the family will have even more opportunity to take advantage of the resort’s vast array of sports amenities – including three 18-hole golf courses, a 28-court tennis centre, cycling and a luxury Wellness Centre. Golf, tennis and football are just three of the junior academies that La Manga Club will be running during the school holidays, with youngsters able to hone their skills under the guidance of the resort’s expert team of sports coaches. For children more creative, and in addition to its Junior Club, the venue will be staging a special activity programme over the Easter holidays, where kids can take part in a series of cookery, arts and crafts workshops as well as enjoying a range of other activities and Easter-themed games. All breaks include complimentary use of the fitness centre, indoor pool, saunas and steam rooms at the resort’s Wellness Centre, plus a free shuttle bus service. In addition, children under-five can eat for free when dining with an adult in one of La Manga Club’s official restaurants. The official overseas training base of the Lawn Tennis Association and named Europe’s Best Golf Venue at the 2018 World Golf Awards for the second year in a row, the resort’s other facilities include a recently-opened European Cricket Performance Centre and more than 15 bars and restaurants. Located in a magnificent natural environment next to Calblanque National Park and the Mediterranean Sea, with a mild year-round climate and enjoying exceptional security and privacy, the exclusive resort of La Manga Club (Los Belones, Cartagena, Murcia) offers luxury, leisure and sport in the same place, and is just a 30-minute drive from the city’s new Corvera airport – which opened in January 2019 – and is an hour away from Alicante. Founded in 1972, the resort now covers an area of 566 hectares containing accommodation, professional sports facilities, relaxation zones, first-class real estate and a private community of 2,300 residents, in a region which boasts more than 300 annual days’ of sun and is surrounded by natural parks and untouched beaches.